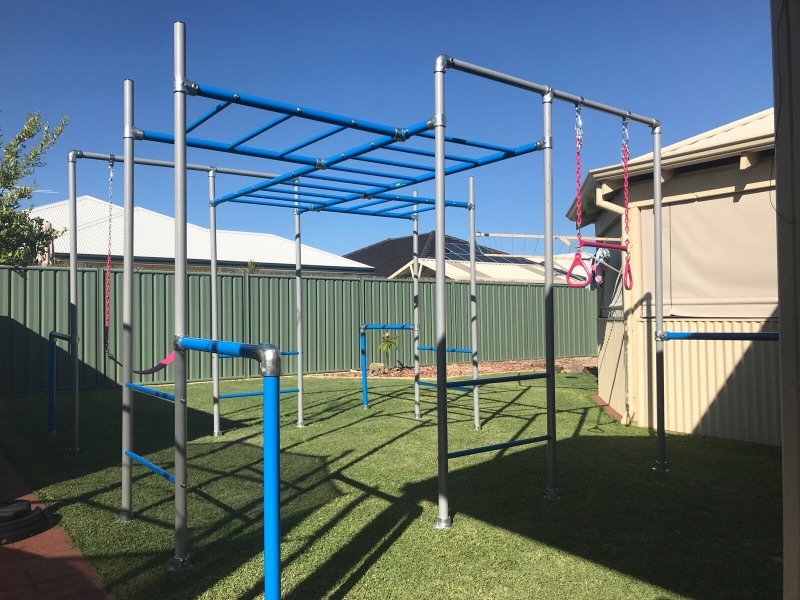 The Gibbon has been designed from our Adventurer design by adding two single swing frames and two twirly whirly bars to create an extremely strong and stable design. The Gibbon comes with a trapeze and sling swing but like all of our models you can customise and interchange with different accessories. Height adjustable from 1.2m to 2.3m and with a roughly 3m by 3m footprint, this is the ultimate outdoor play solution for your kids. 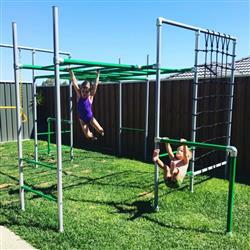 PLEASE NOTE: The Gibbon is load-rated to 1040kgs and is tough enough for adults and big kids. The kids love them. The quality is high. From my 6 year old : " I love the swing because it is high and I can touch the sky!" The Gibbon - such a great investment! I put most of it together while my husband was at work with no problems at all. It looks great! I've bought great looking play equipment before that was hardly ever used. The Gibbon is different because the kids play before school, after school and after dinner. They've been playing like this since January! They're getting really strong too. The Gibbon - By name and influence! 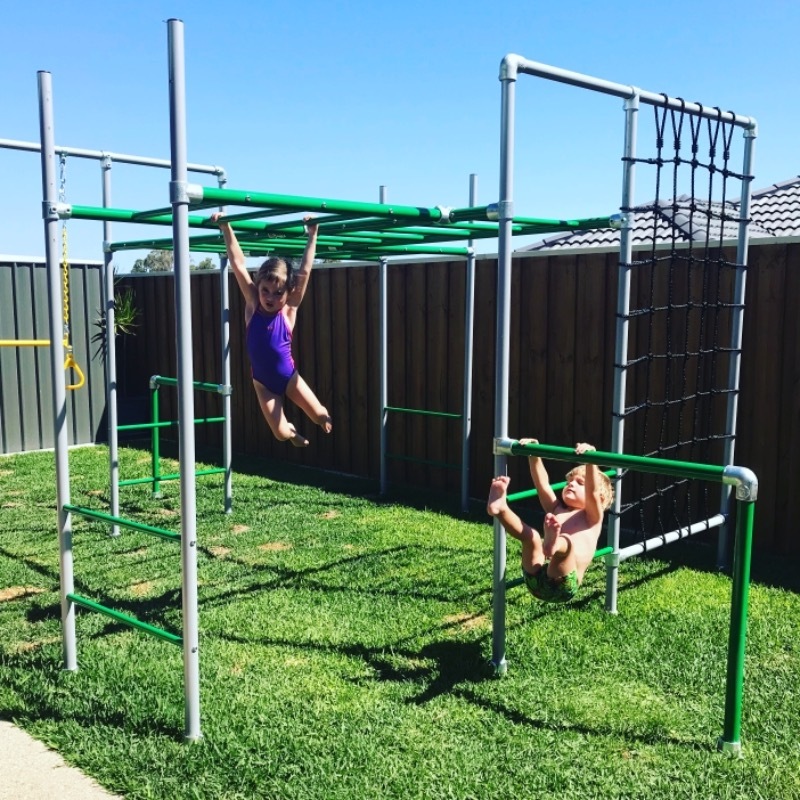 Our experience with Funky Monkey Bars has been nothing short of fabulous! We have a small backyard and 18months prior we contacted Shane to see if they had one that would suit and this is when he recommended the Gibbon/Adventurer. At the time it was out of our price range for Xmas, so we saved hard and had it as a goal for 2017 and we are so glad we did! Our kids have not come off it and in 1 month, they’ve built so much strength and work so well together on there! Our 5.5 year old daughter is doing all sorts of tricks and likes to compete against the clock on the monkey bars and we have a 2.5 year old boy who LOVES the cargo net. We have the trapeze and swing that are easily interchangeable and are quality aceessories! The instructions were great and took us about 3 hours to put together and clean up. Thanks for a fantastic products guys, our family will be enjoying this for so many years to come! 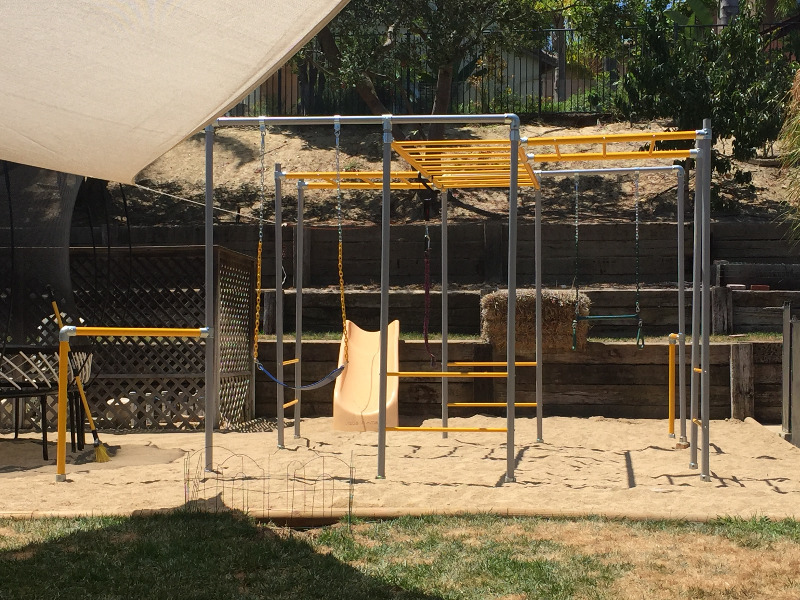 We have four kids who all love the new monkey bars. The gibbon is big enough for all four to play at the same time.